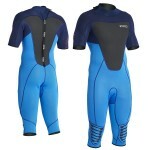 Mystic Kiteboarding design wetsuits specifically for kitesurfers. Compromise and multi-use constraints are not an issue, their wetsuits are designed for kitesurfers by kitesurfers that incorporate features other wetsuit designers wouldn't think of. » Glued and Blind Stitched: Before the pieces are stitched together, they are 2 or 3 times glued. » AIR Span: Extra stretch and durability.Warm, flexible and it lasts. 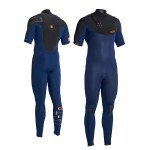 » Kinetic seam positioning: Positioned seams make the suit more flexible and adds comfort and durability. » Sandwich neck closure: The construction of this collar covers all velcro completely with neoprene. » Taped seam connections: An extra neoprene patch on top of inside seam connections. » Asymmetrical Back-Up: This is an extra neoprene layer behind the zipper with collar. » 3D Composite Kneepads: A highly durable and flexible thin knee surface. » Aquaflush Leg Panel: To let out picket up water. 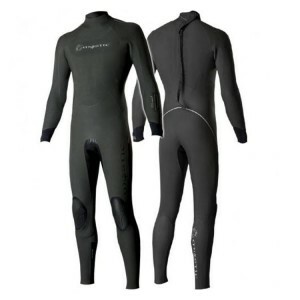 TRI Span Neoprene Foam» This lining has multiple advantages. Most noticeable is the stretch capability. For example a 3mm TRI Span arm panel can easily stretch up to twice its original length. Furthermore the lining is made more durable by cross weaving, is therefore able to stretch evenly in all directions and feels soft on the skin. AIR Span» A neoprene that combines extra stretch and durability. Base on a closed cell neoprene AIR Span is warm, flexible and it lasts.